Each powerful lesson will bring you closer to your life's goals: - How to conquer the ten most common causes of failure - How to make the most of your abilities - How to find the courage to take risks - How to stop putting things off - How to build your financial nest egg - How to look like a winner - How to take charge of your life - And much more in fifty memorable presentations by the greatest success authorities. 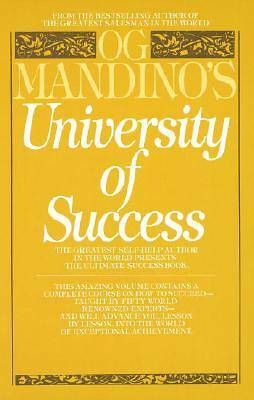 Dean of this unique University of Success is Og Mandino, the most acclaimed self-help writer of this generation. The faculty he has assembled includes such celebrities as Dr. Wayne W. Dyer, Dale Carnegie, W. Clement Stone, Napoleon Hill, George S. Clason, Nena and George O'Neil, Dr. Joyce Brothers, Michael Korda, Lord Beaverbrook, Dr. Norman Vincent Peale, and many more winners in life.